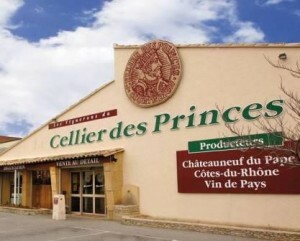 Cellier des Princes is the leading cooperative in the Chateauneuf du Pape appellation. Created in 1924, Cellier des Princes is located in the commune of Courthezon. The name of the cooperative was changed in 1960 to Cellier des Princes. In total, 240 growers participate in the cooperative. Growers working with Cellier des Princes are under contract to provide 100% of their crop for the allotted time of their agreement. On average, close to 150 hectares of vines from Chateauneuf du Pape are sold to Cellier des Princes each year. When added with the other Southern Rhone Valley appellations, close to 750 hectares of grapes are produced and delivered to the cooperative in every vintage. For a cooperative, Cellier des Princes produces some nice wines. Vinification today takes place in temperature controlled, stainless steel tanks. The wines are aged in cement tanks until bottling. The cooperative produces both red and white Chateauneuf du Pape wines. Although the majority of the production is dedicated to red Chateauneuf du Pape wine. The cooperative produces a myriad of different cuvees that are based on the quality of the grapes which are graded from A, B, to C. The grapes are rated depending on their level of ripeness and sugar levels. While they vinify a myriad of different grape varieties, the dominant grape used is of course Grenache. Cellier des Princes produces at least the following wines. The cooperative also produces red and white wine in the Cotes du Rhone appellation. Cellier des Princes can be enjoyed on the young side. Young vintages can be popped and poured, or decanted for about 1 hour, give or take. This allows the wine to soften and open its perfume. Older vintages might need very little decanting, just enough to remove the sediment. Cellier des Princes is usually better with 1-3 years of bottle age. Of course that can vary slightly, depending on the vintage. In the best vintages the wine should be consumed within 3-8 years after the vintage. Cellier des Princes is best served at 15.5 degrees Celsius, 60 degrees Fahrenheit. The cool, almost cellar temperature gives the wine more freshness and lift. Cellier des Princes is best served with all types of classic meat dishes, veal, pork, beef, lamb, duck, game, roast chicken, roasted, braised, stewed dishes, sausage, barbecue and cassoulet. Cellier des Princes is also good with Asian dishes, hearty fish courses like tuna, mushrooms, pasta and cheese. The white wine of Cellier des Princes is best served with a myriad of different seafood dishes, shellfish, crab, lobster, sushi, sashimi, chicken, pork and veal, as well as Asian cuisine. From 100% Grenache, the wine is light in color and in fruit, but there is a sweet cherry essence making this easy and uncomplicated to drink. Medium bodied and easy to like, the wine was made in a soft, early drinking, open, finesse style. This is the top wine from the Chateauneuf du Pape cooperative. This medium bodied wine of pleasure delivers ample kirsch tones, hints of cocoa powder, spice and fresh herbs. Medium bodied, soft and forward, the wine serves up a clean, sweet, strawberry and balsamic finish.